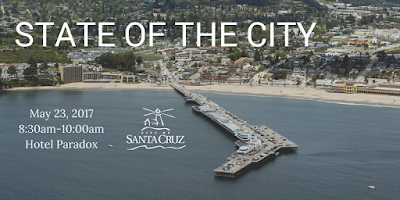 I live in the City of Santa Cruz, and I am quite interested in the "State of the City." 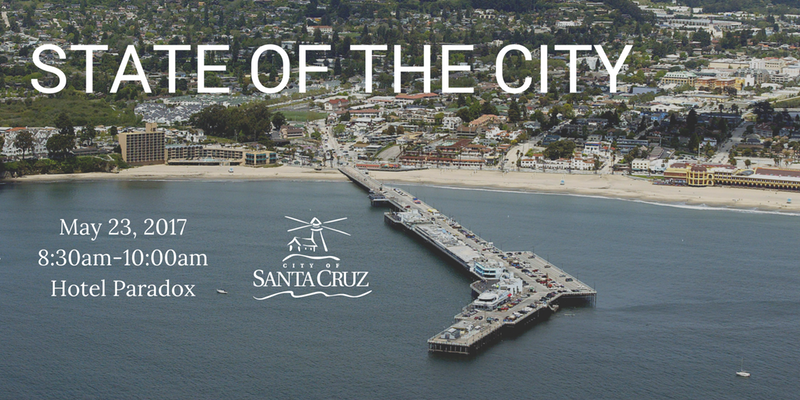 I am particularly interested because the City of Santa Cruz seems to be pursuing a number of planning projects that could radically alter the city's current (and historic) shape and character. One such project would involve putting high-rise structures on the City's Wharf (the same wharf pictured above). Lots of people (over 2,600 at last count) have joined a "Don't Morph The Wharf" campaign to try to send the message to city leaders that the City should be retaining the historic character of the Wharf, one of the most popular places in the City for both tourists and "locals," alike. Then there is the plan to put high-rise structures all along the City's main transportation corridors. I was at a Planning Commission meeting last Thursday evening, on that subject, with about 100 persons in attendance. 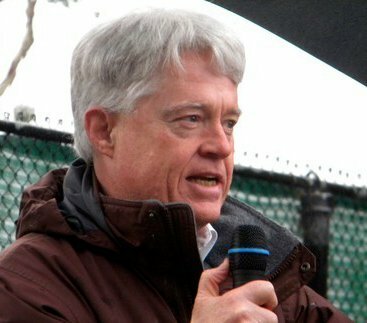 All but two or three of the people who testified indicated a strong opposition to turning Mission Street, Ocean Street, Water Street, and Soquel Avenue into high-rise "corridors," where existing structures would be torn down in favor of new "mixed use" buildings going up to 55 and 65 feet in height. The City planning staff and the project consultant for the so-called "corridors plan," seemed to promise lots of "community benefit," but it's not too clear what the "benefit" might be, since the plan is certainly not good for the existing "community." The current proposal would have very adverse impacts on traffic (already horrendous) and make the adjoining residential neighborhoods much less livable. Those neighborhoods, of course, are where members of the "community" actually live. Those community members are not seeing any future "benefits" to them, from this so-called "corridors plan," and they wonder just who is going to benefit. (Stay tuned, I have an idea that I'll share at the end of this blog posting). 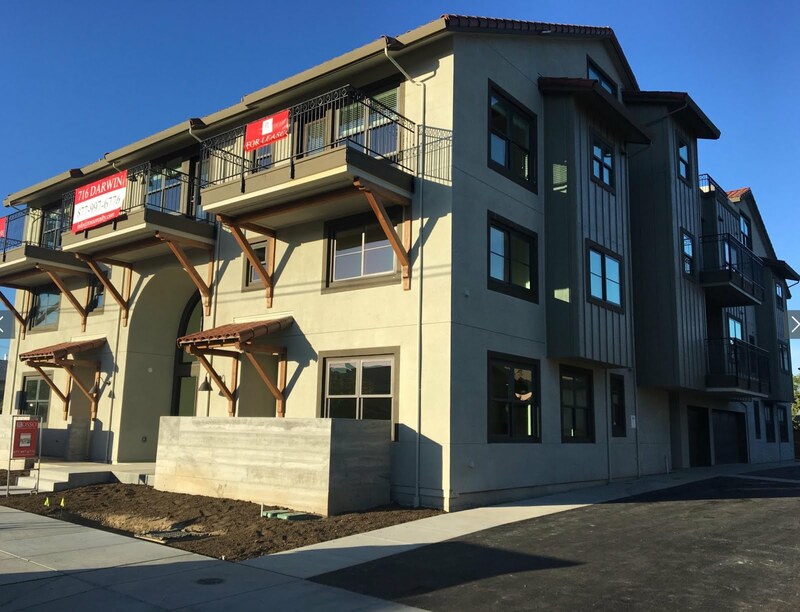 Maybe the worst part of the so-called "corridors plan," besides its basic feature of helping to turn Santa Cruz into a seaside version of San Jose, is the impact that the plan would have on real estate prices, driving them ever higher, and thus making it even harder than it already is to find, or build, affordable housing. 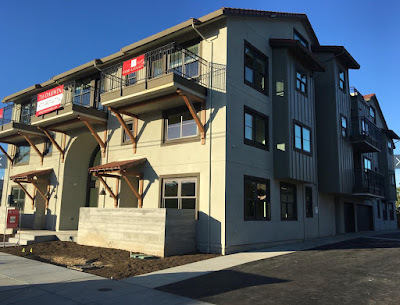 The new development on Darwin Street, shown below, began with the tear down of an existing home, and this kind of "development," exactly what would be promoted by the so-called "corridors plan," will most emphatically not give us more affordable housing. Rents for the new units pictured below will be over $3,700 per month. Anyone interested in that so-called "Corridors Plan," by the way, should probably mark their calendar, and plan to show up at the Planning Commission's next meeting, scheduled for Thursday, May 25th, at 7:00 p.m., at the Santa Cruz City Hall. Here's a link to the Planning Commission agenda. I think there is something wrong with the fact that our elected and non-elected city officials are reporting on the "State of the City" in what amounts to a private meeting, held at an upscale hotel, scheduled during the working day when most people can't attend, and with a $15 ticket price to get in. Having been an elected official myself, I think these "State of..." events should be public, not private, and should address members of the "community." After all, the officials giving the report are supposed to be working for them. Members of the community shouldn't have to pay, either, to hear from their own local officials about what is going on. Look at that last paragraph, though. I think that gives the secret away. This meeting doesn't appear to be focusing on "achievements, challenges, and initiatives" that respond to the City's residents, or to the "community." Instead, this is a meeting focused on how to "strengthen Santa Cruz as a place to do business." Thinking about that so-called "Corridors Plan," it is pretty clear that business people and developers will just love what the so-called "Corridors Plan," would do for them. For the rest of us, though - for the "community" that lives in Santa Cruz now - there is a whole different answer. If the "State of the City" is that finding out how best to give "benefits" to business is the City's main objective (as opposed to focusing on what benefits the community at large), then we have a big problem around here!